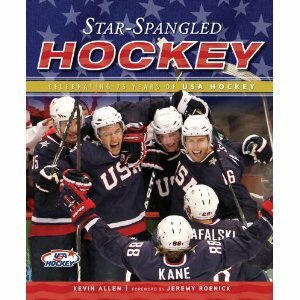 In Star-Spangled Hockey, legendary hockey writer Kevin Allen takes readers on a journey from the earliest days of USA Hockey to celebrate the organization's 75th anniversary. From the beginning, when the organization was started literally out of a shoebox in Tom Lockhart's New York City apartment, to the excitement generated by the 2010 Olympic Winter Games in Vancouver, this book covers the fascinating history of amateur hockey in America. I read the book i found it very interesting.i would reccomend it to any one who is a hockey fan Canadien or american.Documents how far we have come and the United States rise as a hockey superpower. I read it too. Absolutely loved the book and I am Canadian.